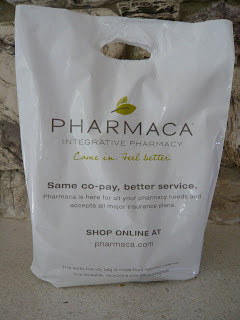 There is a great natural pharmacy in Brentwood called Pharmaca. Every time I'm in LA I stop in and can literally spend 2 hours walking around looking at supplements, vitamins, superfoods, natural beauty products, and all things eco-wonderful. I am obsessed (in a good way) with organic beauty brands and things to nourish my body. Here are some photo's from today's purchase. The loot: Natural Crystal Lavender Deodorant, Pure Encapsulations Vitamin B Complex, Rainbow Light Woman's Multivitamin, Berry Green Supplement, Almond Glow Jasmine Oil, Vitamineral Green Supplement, Blueberry Acai Berry Gummy Pandas, Dark Chocolate Bar.